3. In a connectionless system, which of the following is correct? The destination is contacted before a packet is sent. The destination is not contacted before a packet is sent. The destination sends an acknowledgement to the source that indicates the packet was received. The destination sends an acknowledgement to the source that requests the next packet to be sent. 4. Which IP packet field will prevent endless loops? 5. Which portion of the network layer address does a router use to forward packets? Refer to the exhibit. 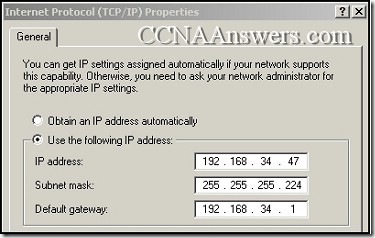 Using the network in the exhibit, what would be the default gateway address for host A in the 192.133.219.0 network? 7. If the default gateway is configured incorrectly on the host, what is the impact on communications? 8. What is the purpose of a default gateway? 9. What type of routing uses information that is manually entered into the routing table? The router sends an ARP request to determine the required next hop address. The router forwards the packet toward the next hop indicated in the ARP table. 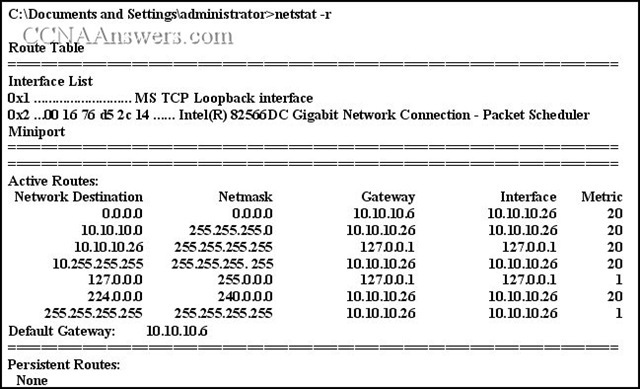 The router forwards the packet to the interface indicated by the source address. The router forwards the packet out the interface indicated by the default route entry. 12. What is a component of a routing table entry? Refer to the exhibit. All devices shown in the exhibit have factory default settings. How many broadcast domains are represented in the topology that is shown? 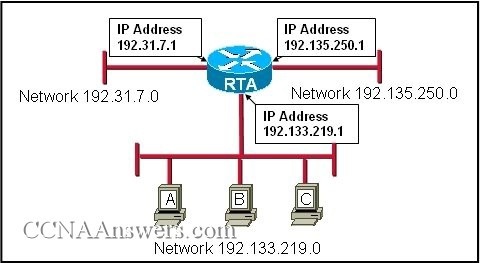 If no route to the destination network is found, the packet is returned to the previous router. 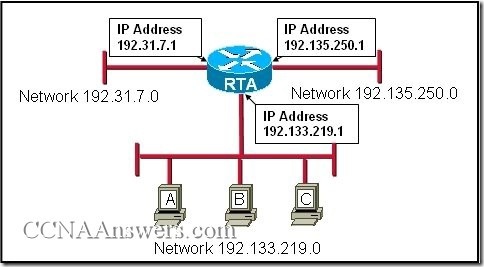 If the destination network is directly connected, the router forwards the packet to the destination host. If multiple network entries exist for the destination network, the most general route is used to forward the packet. If no route exists for the destination network and a default route is present, the packet is forwarded to the next-hop router. If the originating host has a default gateway configured, the packet for a remote network can be forwarded using that route. 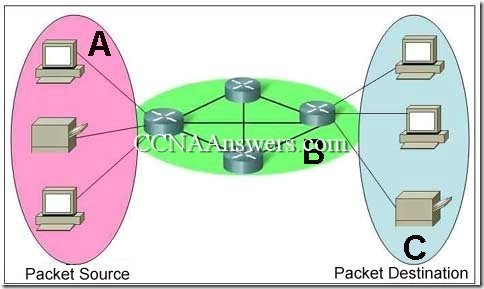 If a host does not have a route manually configured for the destination network, the host will drop the packet. Refer to the exhibit. 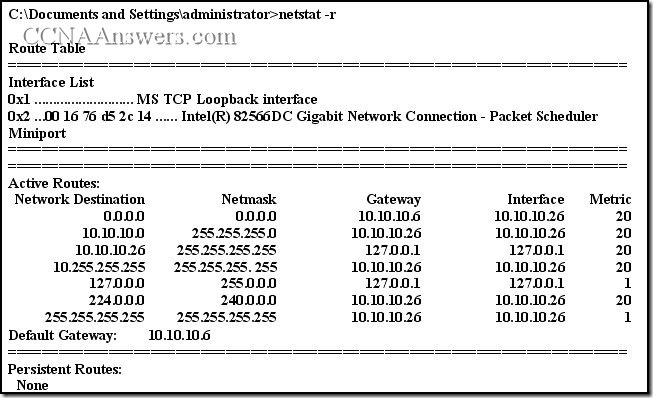 A network administrator is troubleshooting a connectivity problem and needs to determine the address that is used to forward network packets out the network. Using the netstat -r command, the administrator would identify which address as the address to which all hosts send packets that are destined for an outside network? Replace S2 with a router. Place all servers on S1. Subnet the 192.168.0.0 /24 network. Disable all unused interfaces on the switches. 192.168.0.2 is the next-hop address that is used by R3 to route a packet from the 10.0.0.0 network to the 172.16.0.0 network. 10.0.0.1 is the next-hop address that is used by R1 to route a packet from the 192.168.12.0 network to the 10.0.0.0 network. 192.168.0.1 is the next-hop address that is used by R1 to route a packet from the 192.168.12.0 network to the 172.16.0.0 network. 172.16.0.1 is the next-hop address that is used by R3 to route a packet from the 10.0.0.0 to the 172.16.0.0 network. 192.168.0.1 is the next-hop address that is used by R2 to route a packet from the 172.16.0.0 network to the 192.168.12.0 network. 192.168.0.2 is the next-hop address that is used by R2 to route a packet from the 172.16.0.0 network to the 192.168.12.0 network. 21. What statement describes the purpose of a default route? A host uses a default route to transfer data to another host on the same network segment. A host uses a default route to forward data to the local switch as the next hop to all destinations. A host uses a default route to identify the Layer 2 address of an end device on the local network. A host uses a default route to transfer data to a host outside the local network when no other route to the destination exists.